In this weeks blogpost I will inform you some more on how I got to the point of owning my own studio and shooting space. At the beginning, when I first started shooting models, the only thing I wanted to do was shoot on location, since I did not have the ability to shoot inside. You would have to rent a studio, but how does everything work off course when renting a studio without the right knowledge of lights & setups? I started out with small flash. And when the weather became cold I had to go inside for shooting so therefor my first experience with shooting indoors was in my living room with small flashes. After a while I was at the point of having every possible modifier I needed to put on small flash (including my self-made beautydish from an Ikea salad bowl). In the beginning it was a lot of DIY materials. Snoots made with black straws and so on. After that I decided to go with Jinbei studio lights. With the new heads I started shooting inside in the living room untill we came to the point that the regular backdrops (white/black/gray) became too boring. I wanted to switch things up, so my dad came with the solution of creating wooden backdrops which we could cover with wallpaper. That being said, after a while again, that became pretty boring, and we ware at the point that I was starting to have paying customers, i had to start looking out for a space to rent, on my own, or with another photographer. Doing so with another photographer seemed like a good idea but it became clear to me that what if he needed to shoot, and I needed to shoot. That was problem number one. And in the long run, for me it seamed easier to just build my own studio, since we had the space to build one. I started looking out for possible options, stone, metal, wood. I decided to go with wood. Started looking around and after thinking it trough I bought myself a wooden construction of 10mx5m. Luckily for me, my dad, brother & grandfather are very handy. 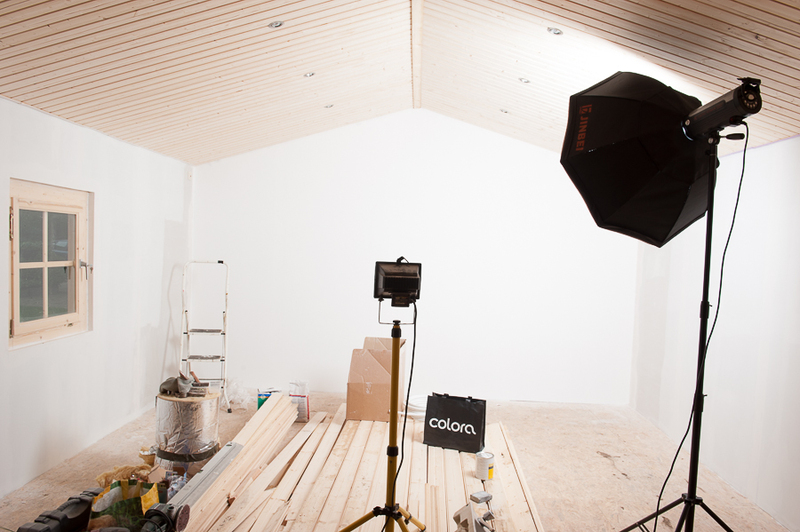 So the studio was build. In 2013 I started teaching workshops, with the results, the more space I could get the better, so in the summer of 2013 I looked out for an expansion of the studio, so the total now was 15mx5m. The studio for me was big enough, we were able with the expansion to give the makeup artists a seperate space, create more different backdrops, and some more space for people joining our workshops. During this period of time i've extended my lights and switched over at the beginning of the studiospace to Elinchrom Lights. So space was needed to put my material in. 3 Weeks ago (13/01/2014) I wanted to change things up a bit and decided to put a new floor into the studio. After a few days the works were completed so we could get back to shooting now. That's it for this weeks updates. If you got any items you want me to write about, let me know by contacting me, feel free to comment on this blogpost!